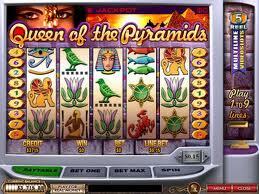 Queen of Pyramids is the newest slot to be released from the reputable Playtech team. We have seen this Egyptian theme used in a variety of slots many times over, but this one surely offers something a little different in terms of pay-outs. The small 9-payline structure is the host for Queen of Pyramids most prolific feature: a whopping progressive jackpot! Playtech’s progressive range has established itself as ‘frequent droppers’ and this particular version fits the bill perfectly. It currently averages over $55,000 when hit and with a decent sized minimal amount in place, players can look forward to a huge win every time. The game itself is very decorative but in places a little confusing. Take the symbols for example, there are a little too many hieroglyphic style icons used and once a spin is settled players are greeted to a maze of colour and not much more. In all fairness that doesn’t detract from the enjoyment of playing such a high quality slot as the developers have ensured there has been no stone left unturned in ensuring an authentic feel is met. The game doesn’t just offer a big top prize, there is an abundance of in game features to get stuck into as well as a very sizeable free spins round. The star of the show acts as the games wild, making way for a multitude of extra winning lines by substituting for every other symbol within the game. The scatter within Queen of Pyramids is depicted as the Scorpion and triggers 10,25 or 100 free spins when 3,4 or 5 are hit anywhere in sight. It is uncommon to see a slot offering such a huge amount of free spins and with the prospect of adding in a 5x multiplier into the mix, the outcome could be a lot more than you expected. Another great aspect of this lucrative round is that the free spins can be re-triggered, making it a truly big hitter in terms of potential pay-outs. The main bonus round on offer is a very glamorous ‘spin the wheel’ style game that gives players the chance to walk away with sizable cash prizes. Triggered by hitting 3 unicorn symbols on an active pay line the wheel of fortune is presented and it is up to the player to hit that button and reap the rewards. The free spins round surely offers more in terms of returns however for level of interaction and excitement, this takes the cake. Queen of Pyramids is a small slot with a big engine, granting players access to the wonderful Egyptian world and a host of wonderful treasures to unveil.